Break Even Load Factor Snapshot – Aircraft Operating Series » OPShots.net - Cyberhub to Cleveland Aviation and the World! On January 12th, 2015, Delta Air Lines Flight 6259 took off from Cleveland Hopkins, destined for New York LaGuardia, with only two passengers on board. Earlier flights had suffered long delays, so all passengers rebooked, except one. The flight nearly departed with the one passenger who did not rebook, but shortly after disconnecting from the jet bridge, DAL6259 reconnected so another passenger could board. GoJet Airlines operated the flight on behalf of Delta Connection. The Canadair CRJ700 that operated the route has a capacity for 65 passengers and four crew, two flight crew and two cabin crew. The flight operated 63 passengers short of full capacity, forcing Delta to cover the loss. Airlines determine their route costs and profitability based on the cost of flying one passenger one mile. The formula for this calculation is to divide the total operating costs by the total number of miles flown multiplied by the number of seats onboard the aircraft. The average ticket price on a Delta flight between Cleveland and LaGuardia is $250.00. Delta Flight 6259 flew 465 statute miles, averaging 456 knots (524.7 mph) between Cleveland and LaGuardia. The plane operated at 3.8% capacity. Delta’s load factor is 82.8%. It is not uncommon for airlines to operate their aircraft far below full capacity because the plane is usually needed in the destination city for a later flight, but it is rare to operate at a capacity as low as Flight 6259. Generally, the cost per seat mile, or the cost to fly one passenger one mile when every seat is full, ranges from 7.5 cents on a low-cost carriers such as Allegiant, JetBlue, Frontier, Southwest, Spirit, and Virgin America to 12 cents on network carriers such as Alaska, American, Delta, Hawaiian, and United. An estimate of the basic cost of this flight when operating at full capacity, for 465 miles is $3627.00. So at what capacity must airlines operate at to break even? For every airline and every flight there is a percentage of seats that the airline must sell at a given yield, or price level, to cover the flight’s operating costs, as to not lose money. This is called the break-even load factor, which varies by airline, and fluctuates based on expenses. Escalating costs push up the break-even load factor, while increasing prices for airline services lower it. In recent years, the break-even load factor for the industry has been approximately 66 percent. 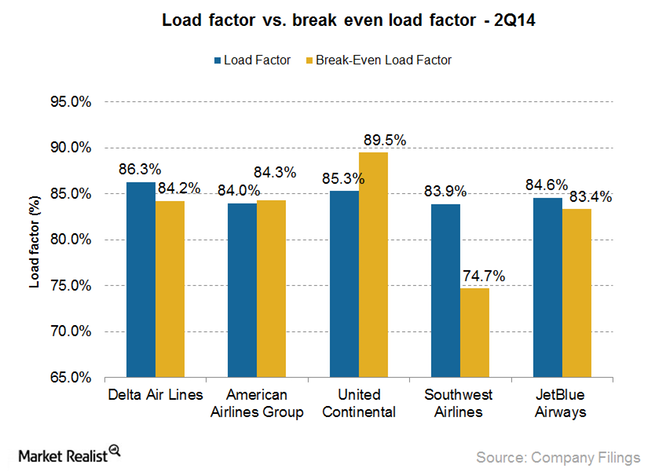 Airlines typically operate very close to their break-even load factors. The sale of just one or two more seats on each flight can determine the difference between a profit and a loss for an airline. The Delta Connection flight above lost money, but the aircraft had a schedule and needed to get to LaGuardia for its next leg. The load factor, or capacity, for an entire airline is calculated by dividing revenue passenger miles (operating revenue earned per available seat mile during a reporting period) by available seat miles during a specified period of time. In 2011, Delta’s break-even load factor was 85.0% capacity. Its average capacity was 82.8%, 2.2% off of breaking even. 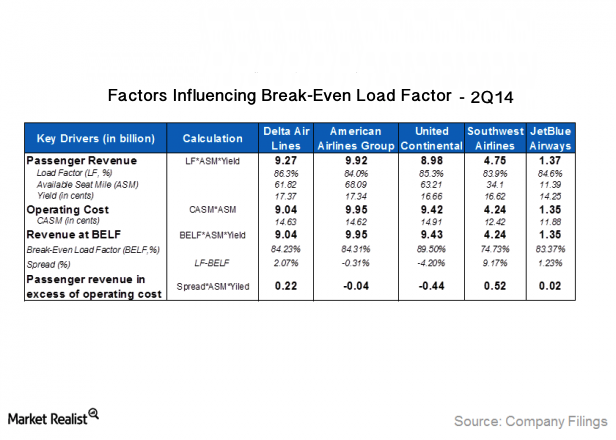 In June 2014, Delta reported its break-even load factor to be 84.23%. Its load factor is 86.3%, 2.07% above its break-even. A snapshot of second quarter break-even load factors in 2011 for domestic flights shows network carriers Alaska, American, Delta, Hawaiian, and United needing to fill 86.8% of their seats in domestic operations to break even. At that time, they averaged 86.0% capacity, just one passenger short of breaking even on a 160-passenger jet. Low cost carriers Allegiant, Frontier, JetBlue, Southwest, Spirit, and Virgin America had to fill 79.3% of their seats in domestic operations to break even. At that time they averaged 83.0% capacity. The domestic operations study does not take into account international flights, which are often most profitable, as well as ancillary revenue such as baggage fees, reservation change penalties, on-board food and services, which also add substantial revenue for airlines. Great start Cole, can’t wait to read the rest!